I have been invited to participate in The Reason concert several times over its many years. The last few times (2015 and 2016) I was asked to emcee and paint at the same time. 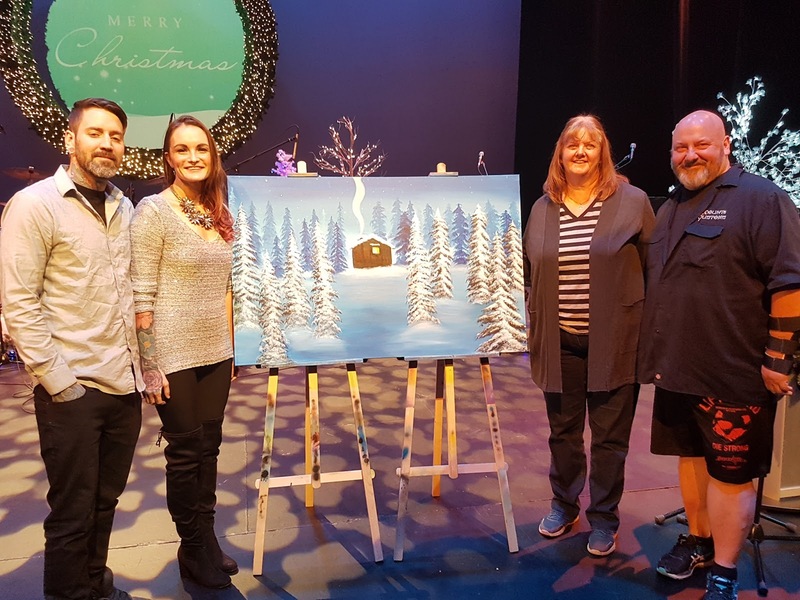 It was nice to see two incredibly talented young people picking up the painting torch last night and Lorne Baker and Dawson Winsor taking on the emcee duties. Ben and his wife Autumn did a team painting. It was remarkable to watch them work in tandem in front of a large audience at Keyano Theatre. The music choices seemed to infuse the painting with deeper meaning and warmth. And the comic duo of Lorne and Dawson kept the program on track and the audience engaged and laughing. 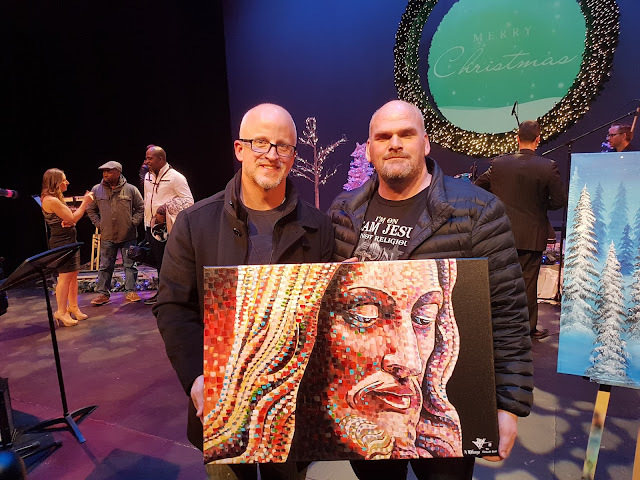 I was set up in the lobby as people arrived, turning a 20" x 30" gallery canvas print of the painting of Jesus I did earlier this year at the 91.1 The Bridge fundraising banquet into an EP (embellished print). I added hundreds, if not thousands, of brush strokes, being guided by the warm and festive energy of the people arriving to enjoy The Reason. I finished up about 45 minutes into the concert and signed the EP as 1/1 with my signature and "The Reason 2018". 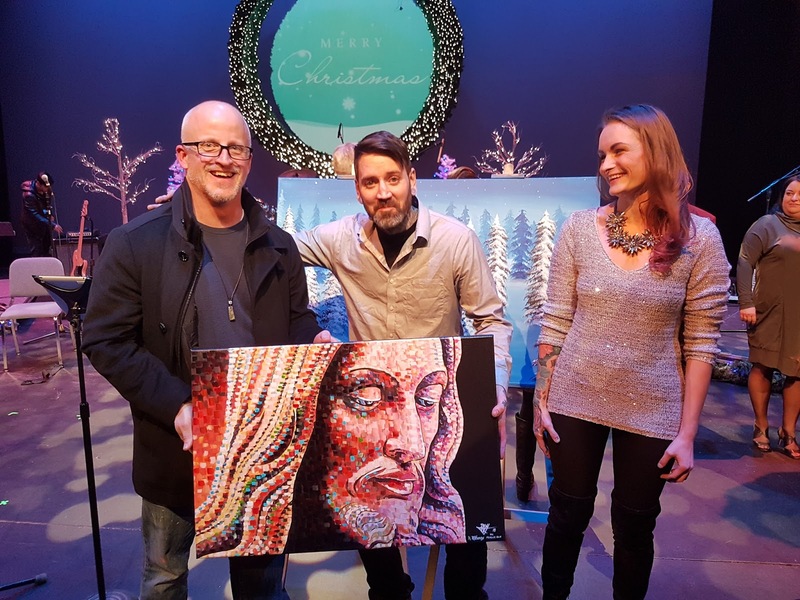 It was auctioned off after Ben and Autumn's amazing painting and was purchased by Bernie for $2,000 with all proceeds supporting several different charities. The music is always spectacular of The Reason, truly world class in my view. I was able to grab a seat in the second half and soak in the sounds. I particularly loved "There's a New Kid in Town", a duet with Dawson Winsor and Tina Baker. Apparently, they've been singing together for years. Dawn Herman's voice was spectacular as was Chuck Vincent's and Leona Sceviour. And Gabriel Chinedum's sax was sensational. The Dressed in Black band was equally awesome. 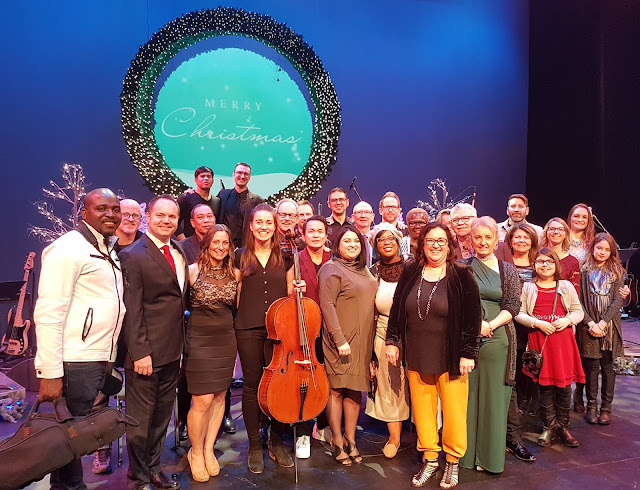 My thanks to Paster Beverly Fawcett for inviting me to be a part of this marvellous celebration of The Reason for the season. It's an annual reminder of the peace, love and fellowship that is the heart of Christmas.